'Corruption rabbi' beseeches President Reuven Rivlin over medical condition; officials expect request to be rejected. 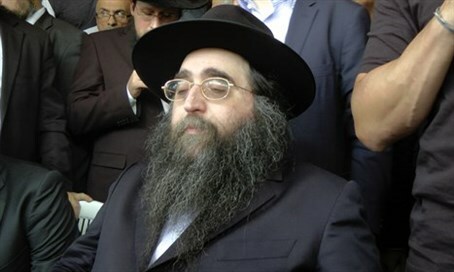 Rabbi Yoshiyahu Pinto has submitted a request for pardon, Channel 10 reports Tuesday, just two months after beginning his jail sentence for corruption. Pinto based his request on his deteriorating medical condition, which he has referenced time and time again throughout legal proceedings against him. He allegedly suffered a heart attack in April 2015 while boarding a flight back to Israel to face corruption charges; his supporters claim he suffers from cancer and has undergone multiple surgeries that have weakened him greatly. In February, a court ruled that Pinto would be permitted to serve his one year sentence in the Nitzan prison’s medical center. Senior political officials told Channel 10 late Tuesday that Justice Ministry officials are widely expected to reject any pardon request from President Reuven Rivlin for Pinto. Pinto has been involved in multiple corruption scandals. He was convicted for attempting to bribe senior police officer Ephraim Bracha with $200,000 for information about a pending police investigation into the Hazon Yeshaya charity organization, which Pinto was rumored to be closely involved with. Bracha immediately reported the incident to his superiors, prompting a separate investigation against Rabbi Pinto himself. The statements were later found to be violations of the plea deal, causing three of his most high-profile attorneys to quit the complex case in October 2015.